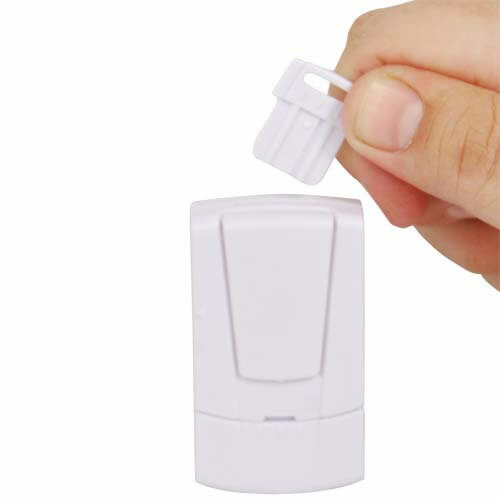 The Door and Window Alarm with Deactivation Key is an effective product that protects your doors or windows. When a door or window is opened, an alarm will sound alerting you. Great for stopping your teen from sneaking out! The Door and Window Alarm with Deactivation Key is an effective product that protects your doors or windows. When a door or window is opened, an alarm will sound alerting you. This unique model can only be turned off with the deactivation key. The 105-decibel alarm lets you know that a door or a window has been opened. Use these wherever you want additional security such as on all ground floor openings. Our brilliant customers have also found another use for this particular safety device. TIP: Super Glue the battery compartment shut so it can't be disabled. There are many inexpensive door and window alarms on the market today. The problem with most of these is that they are meant to sound off when someone is entering the house. They have on/off switches and are too easy for your teenager to just turn them off before slipping out. When they return, they can just turn them back on again. All the while, you are "left in the dark". What about an alarm that works when the window is opened from the inside? There is a solution to this ever-growing problem. 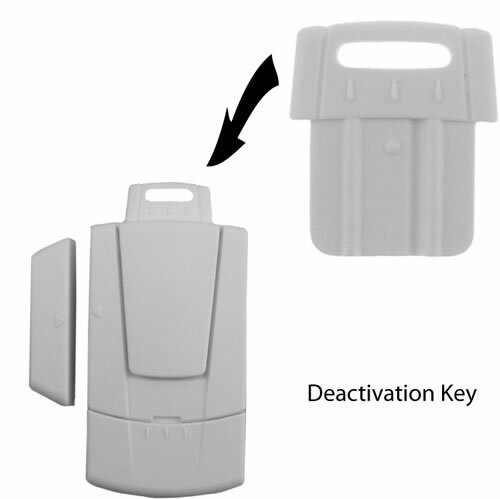 A Door and Window Alarm with a deactivation key. 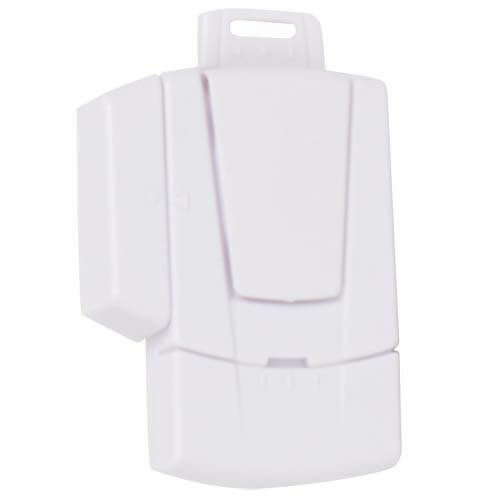 Because this wireless alarm is self-contained, you are able to arm and disarm the unit with the key. The inexpensive price comes in handy when you need to cover several windows and doors that are being used for a swift escape. This is a very economical way to keep someone out of someplace you don't want them to be, or alert you to their presence. Batteries are included. 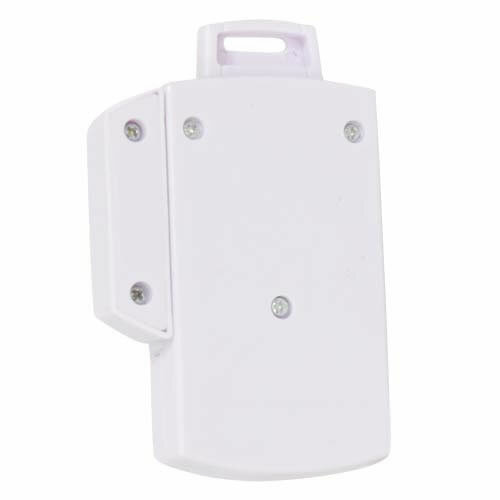 When you install a magnetic door alarm to any door in your home, it will emit a shrill sound every time the specified door is opened and it will only cease when the door is closed. Burglars and vandals are sure to flee your home immediately when they realize that the alarm has alerted home occupants to their presence. Quick and Easy Installation All you need is double stick tape and your magnetic door alarm is ready to act as your 24/7 bodyguard. Make sure, however, that the distance between the sensor and the magnetic door alarm is no greater than half an inch. Here are several reasons why these make an ideal home security device. Affordable Why spend so much money on other home security devices when you can get the same result? User-Friendly They are very easy to operate. It comes with a on-off switch for instant activation and deactivation. Discreet Design Unlike other home security devices, these do not stand out like eyesores in an otherwise beautifully decorated room. They are not that much different from wall-mounted switches in terms of appearance. When you install them on top of the door, they might as well be unnoticeable. They’ll also be out of your children’s reach, which is a good thing because they won’t be able to accidentally deactivate the alarm. How Magnetic Door Alarms Can Help You Besides deterring potential intruders, they can also protect your loved ones – especially if you have children at home – from other dangers. Prevent Entry through Windows Magnetic door alarms may also be used on windows, another commonly used entry point by intruders. You can place them on top of the window and cover them partially with blinds or curtains to hide them from view. Protect Individuals with Special Needs or Disabilities Elderly loved ones suffering from Alzheimer’s, children with special needs, and other similar cases require constant supervision. There may be times, however, when your attention strays even for the shortest moment. Unfortunately, that’s long enough for them to go missing. Don’t wait for this to happen. Use magnetic door alarms to alert you when your loved one attempts to leave the safety of your home.